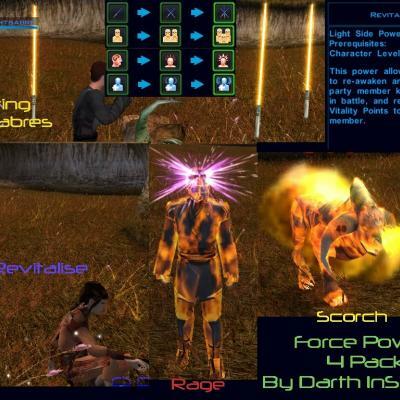 This mod adds four new, three-tier Force Powers to KotOR - Rage, Scorch, Revitalise and Floating Lightsabres. 1 is Light Side, 1 is Dark Side, and there are two Universal Force Powers. You may recognise a few of these names from TSL or Jedi Academy, and that's because I have now recreated them for K1. Rage: Dark Side power, available at Level 13. Gives the user a bonus of +4 to Strength, +3 to Dexterity,+2 to Constitution for 20 seconds and a 50% speed bonus, while there is also a penalty of -3 to Intelligence, -2 to Wisdom, -1 to Charisma; after that the character's FPs are severely depleted, as are the character's VPs. 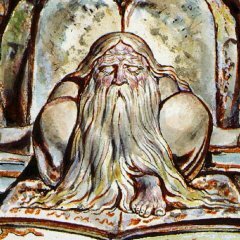 Further, the penalties to Wisdom/Intelligence/Charisma remain, and the bonuses to Strength, Dexterity and Constitution are now penalties for 10 seconds. Knight Rage: Dark Side power, available at Level 16. Same as above, but the bonuses have increased to +4 STR, +4 DEX, +3 CON, and the penalty has increased to -4 STR, -3 DEX, -3 CON; the WIS/INT/CHA penalties remain the same. Master Rage: Dark Side power, available at Level 19. Same as above, but the bonuses have increased to STR +5, DEX +4, CON +4; the penalties remain the same. Revitalise: Light Side power, available at Level 9. Allows you to restore to life any non-droid party member killed in combat, restoring 10 VPs. Knight Revitalise: Light Side power, available at Level 12. Same as above, but will restore 20 VPs. Master Revitalise: Light Side power, available at Level 15. Same as above, but will restore 30 VPs. Scorch: Universal power, available at Level 9. Projects a spray of flame at the target, causing damage. Knight Scorch: Universal power, available at Level 12. Same as above, but does twice the damage. Master Scorch: Universal power, available at Level 15. Same as above Scorch, but does three times the damage. Floating Lightsabres I: Universal power, available at Level 10. Spawns a single lightsabre, to help you in combat, which lasts for 20 seconds . Without giving too much away, this should remind people who've played TSL of the final battle...These sabres will be a different colour depending on your alignment if you are Light Side – blue for guardians, green for consulars, yellow for sentinels, or red if you are Dark Side. Floating Lightsabres II: Universal power available at Level 13. Same as above, but spawns two lightsabres, which last for 30 seconds. Floating Lightsabres III: Universal power available at Level 16. Same as above, but spawns three lightsabres, which last for 40 seconds. -Some people - those with Radeon graphics cards, in particular - may run into some graphical issues - namely, the lightsabres appearing to have an all-black 'body'. I've tried to get rid of this effect, but have had no luck so far.